After years of doggedly gnawing through seemingly endless rolls of federal red tape in pursuit of a deed-restricted transfer of about 316 acres of land from the Bureau of Land Management to Ketchum, the city’s Parks and Recreation Department has reported that the BLM—frugal following federal budget cuts known as the “sequester”—is now eager to get the land off its hands. 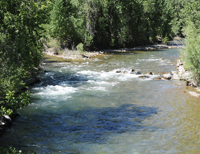 The transfer would allow the Ketchum Parks and Recreation Department to build a whitewater park at the site, near Hulen Meadows subdivision north of Ketchum. In March, the department reported to the City Council that it expected indefinite delays to the land transfer—and therefore to the whitewater park project—due to the BLM’s lack of funds. At a City Council meeting on Monday, Parks and Recreation Director Jennifer Smith said the transfer is now on an “aggressive timeline” and construction on the whitewater park could begin as soon as the fall of 2014. The city first applied for the transfer in 2008. To maintain the forward momentum, the council unanimously agreed to Smith’s request that the city provide $50,000 in administrative support to the BLM, paid for entirely by private donations from the Wood River Land Trust and the Whitewater Park Committee. Those organizations are the city’s partners in the land transfer effort, the main focus of which is based on conservation. The BLM will use the money to hire an independent contractor to review an environmental assessment of the whitewater park project. Otherwise, the BLM would not have had the funds to review the assessment, effectively halting the project and the transfer. “This will definitely expedite the process, to have the review contractor, by leaps and bounds,” said Cherise McLain, an attorney for the city. According to McLain, Ketchum will maintain veto power over contractors selected by the BLM. “It’s not just a free bank account for the BLM to do with what they want,” she said. The council also unanimously agreed to another request by Smith for the city to manage and maintain the land for the BLM for free until the transfer occurs. Since 2006, the BLM has paid the Parks and Recreation Department $2,500 per year to do so, but the agency recently advised the city that it cannot afford to continue paying up. “It’s in the best interest of the community and the [transfer] for the city to continue to maintain the land [for free],” Smith said. Lastly, the council unanimously approved Smith’s request for the Parks and Recreation Department staff to begin work on the final design process for the park. Smith said she will return in June to request about $300,000 from the council to pay for that process, split over fiscal years 2013 and 2014 so as to not be such a large amount in the same budget. She said private donations will cover those costs as well. She said private donations should also cover the about $2.3 million price tag to construct the park. A drop feature is a whitewater rapid or waterfall integrated into a whitewater park. Council President Baird Gourlay voiced concern that there might be insufficient private donations to cover the construction costs. “I’m scared to death of this one,” he said. Councilwoman Nina Jonas said that it’s been the private donors who have kept the project going over the years. In an interview after the meeting, Smith said the project would provide river play, flood mitigation and habitat restoration, including restoration of the currently sediment-threatened Hulen Meadows Pond. At the meeting, Hulen Meadows resident Jim Jaquet, former Ketchum city administrator, said the whitewater park project is the “only opportunity” to restore the pond and that the project would benefit the whole community. In the past, the plan has been contested by several Hulen Meadows residents who raised concerns about the project, including the park’s design and the traffic it would generate in the area. There was no public comment against the project at the meeting on Monday. To view the current, not final, version of the master plan for the park, visit tinyurl.com/ime-masterplan. “Luckily, we got the process back on track,” Hall said.